We grow beets, potatoes, azuki beans, wheat, strawberry plants, and other vegetables on a 63-hectare farm. 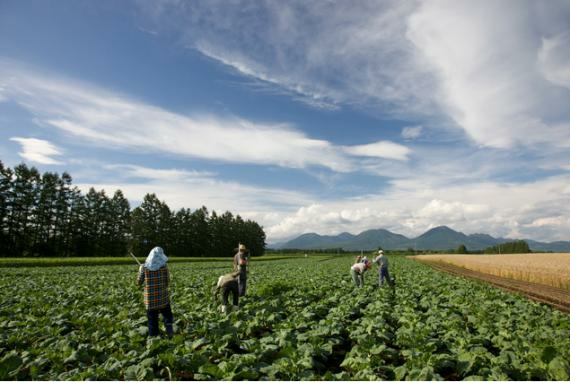 At Farm Inn, you can fully enjoy Tokachi’s grand scenery, delicious food, and fresh air. You can also harvest seasonal vegetables at different times of the year. Come farm with us under the blue sky. Drive a tractor Make tofu *And take home soybeans and nigari Make key accessories with egg art (Cut out and paint an ostrich eggshell to make your unique accessory.) Ingredients (1 serving) *Available from 2 people Dinner: Beef (with sauce) 200g, Daisougen no Houbokuton pork, rice balls, seasonal vegetables (e.g. onions, bell peppers, eggplants, etc.) Breakfast: Kamokudo sliced bread, fresh eggs, Daisougen no Houbokuton bacon, milk, seasonal vegetables (e.g. lettuce, cucumber, tomato, etc.) *Please prepare the meals yourselves. *Ingredients will vary depending on the season.